Good Monday morning, friends! It's time for another recipe challenge, and this week we are working with flowers. Flowers in the recipe, and flowers ON the recipe. What a fun idea. Have any of you ever had friend pumpkin blossoms? I actually have. It's been years, and at the time I thought it was really weird, but they were YUMMY. I knew exactly where I was going with this card when I saw the theme, and the cute pumpkin cut with the Cricut that will be available in a new kit from Scrapbook Store At Your Door. The prima flowers, polka dot brad, textured card stock, and colorful Alex line of papers can all be found there too. It's a one stop shop, so head on over there and place your order for all of your papercrafting needs. Also, please be sure to hop over to the Recipe Challenge Blog to see the beautiful samples from the rest of the DT girls. Their creations are so wonderful, and you'll find some fantastic recipes there. Play along if you have time, so that we can see your beautiful work and share your favorite flower infused recipe. Also, while you're in the neighborhood, become a follower, so you won't miss one yummy detail!! Thank you so much for stopping by today. I hope it is dry in your part of the world. We are water logged here. We've had between 6 & 7 inches of rain in the last day and a half, with that much more expected. All I can say is its good weather for stamping, reading, and curling up for a nice nap. Have a glorious, and sunny day, my friends! 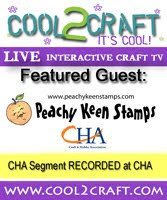 I'll have a Peachy Keen project to share with you tomorrow, so I'll see you then!! Many happy blessings to you!! Lorie, I love what you did with the little pumpkin! He is sooo cute! I'm not sure if I will try the fried flowers, but the recipe card is sure cute! I hope you get your recipe stand!!!!! oh lori! not onlyh does this sound yummy, it is stunning. my recipe file could really use a makeover. trouble is.... hubby is the cook and never, ever uses a recipe. me? nope. not a cook. oh, i know how, but i never cook. but boy am i good at making reservations!!!!! Lorie I just love this recipe card, and that pumpkin is just to cute. A gal after my own heart. I love hand stitching while watching TV. It's so amazing that I saw this recipe because I was just thinking about going to the garden to pick tomatoes and pick the remaining flowers off the pumpkin plants. Now I may wait until later in the day so I can try this recipe.